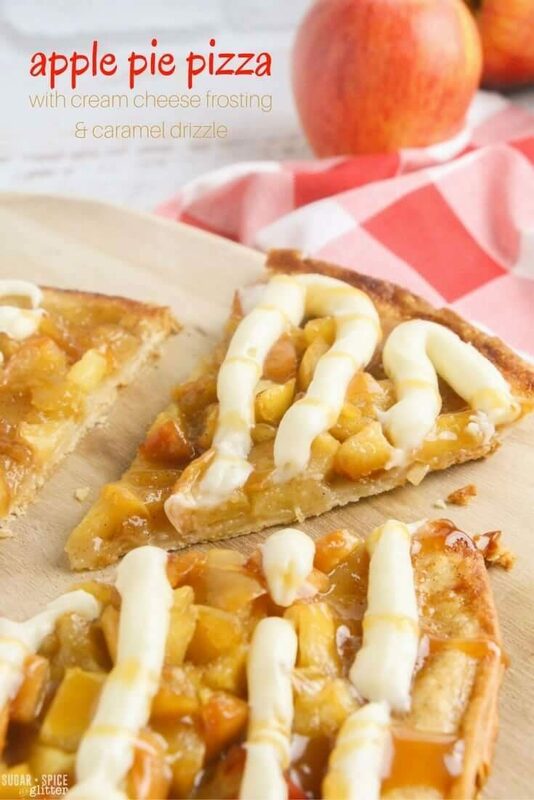 Originally, I think I envisioned fresh apples on top of an actual pizza crust but when I said the words “apple pie pizza” to Ella, she quickly changed the course of this recipe – and I’m glad she did! 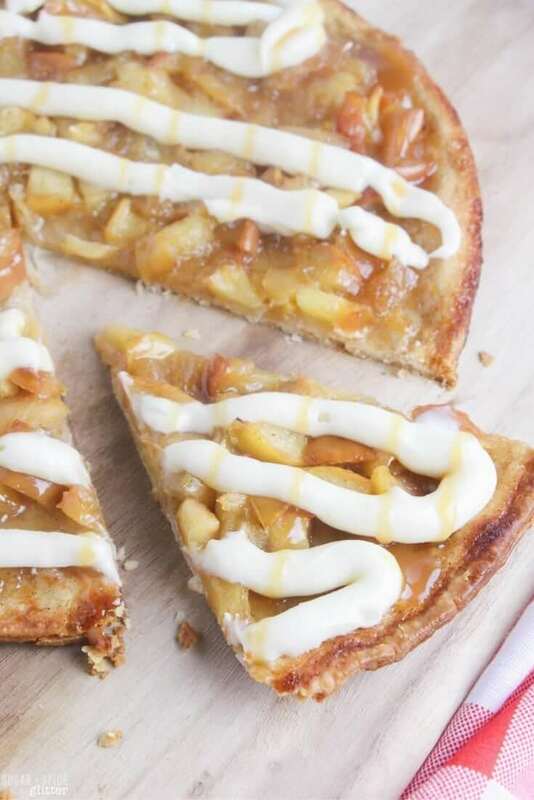 However, you can definitely make this apple pie pizza with store-bought butter puff pastry (or pie pastry) and it would turn out just as delicious. 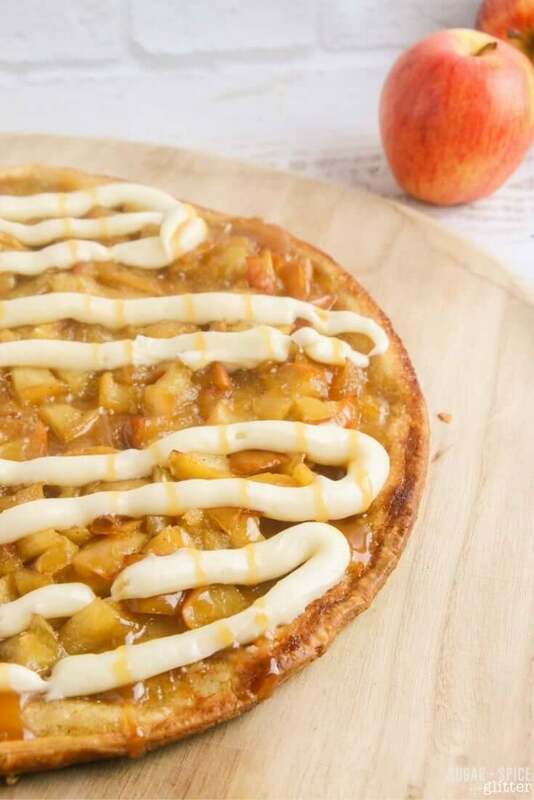 The real magic happens on top of that crust – a quick apple pie topping, fresh cream cheese frosting, and hint of caramel drizzle. 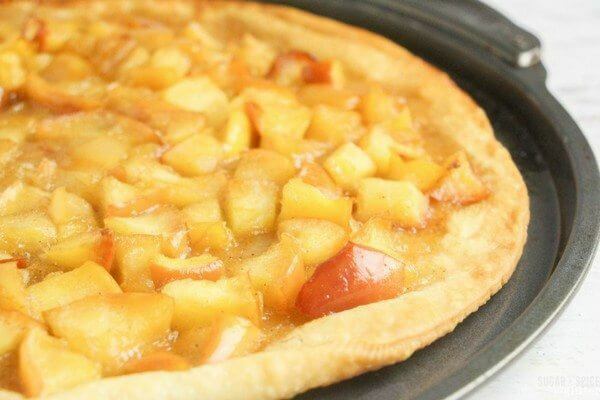 This would also be delicious served with a big scoop of vanilla ice cream on top for some apple pie pizza a la mode. 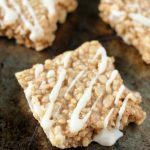 If you’re looking for a delicious, kid-made dessert that is just perfect for fall, you really can’t go wrong with this recipe. I expect we will be making a few variations of it in the months to come. 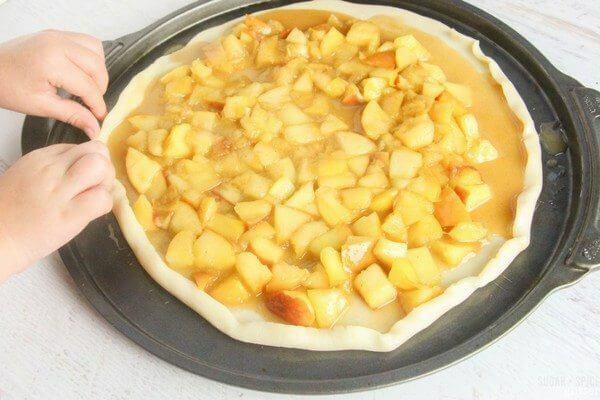 Preheat your oven to whatever temperature called for by your pastry crust (or 350F if using homemade dough). 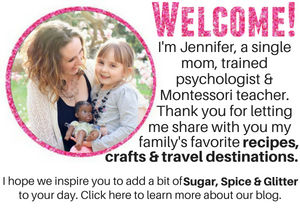 First, have your child chop up the apples into 1″ cubes. We had to work on not chopping them too small – Ella was excited to show off her dicing abilities, but if the pieces are too small they may burn in the oven. 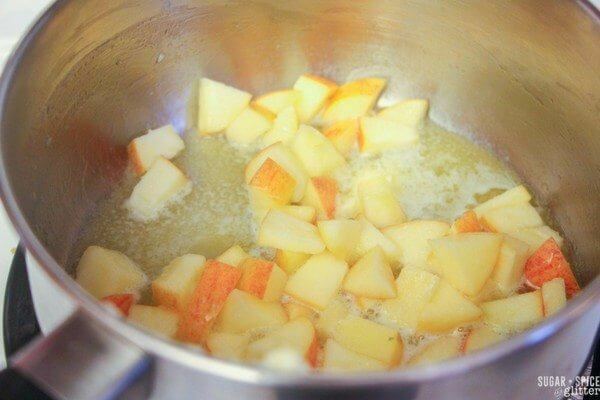 Add the apple cubes to a saucepan with the butter. Saute for about 4 minutes before adding the brown sugar and cinnamon. 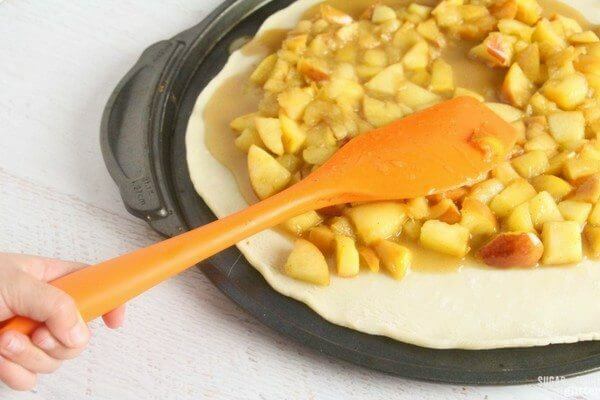 Cook for another 3 minutes until a soft caramel forms. 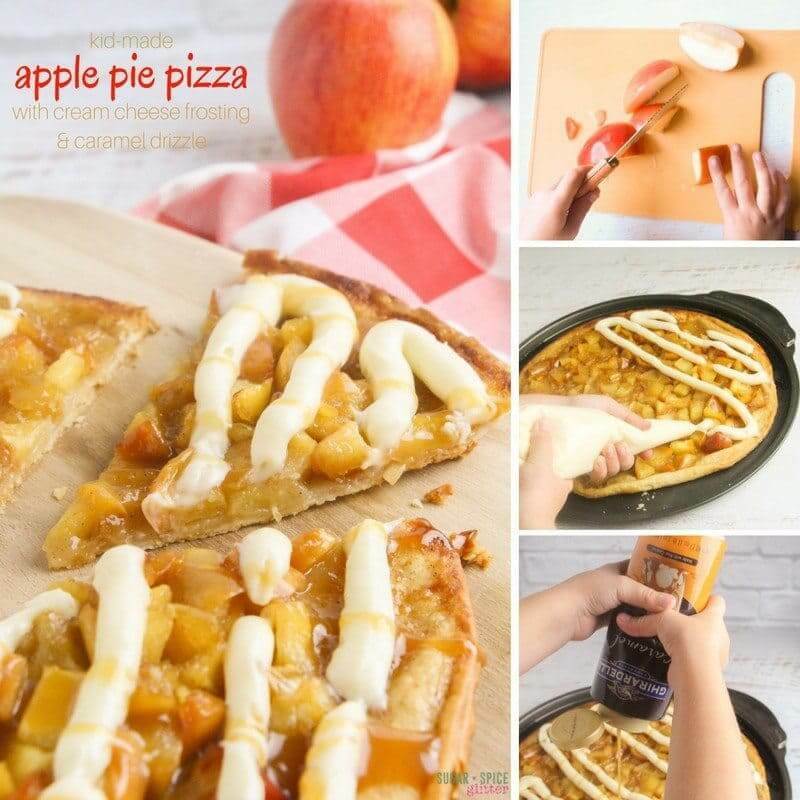 Carefully pour the apple pie topping onto the pizza and spread it around for even distribution. Try to keep a crust of at least an inch all around. Place the pizza in the oven for 8-10 minutes until the crust is golden brown. 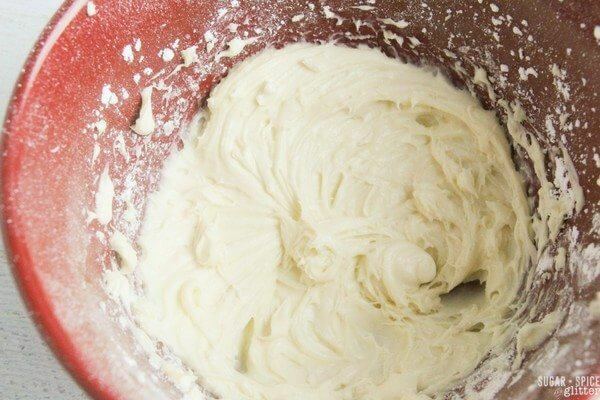 While the pizza is baking, whip together the cream cheese frosting ingredients. 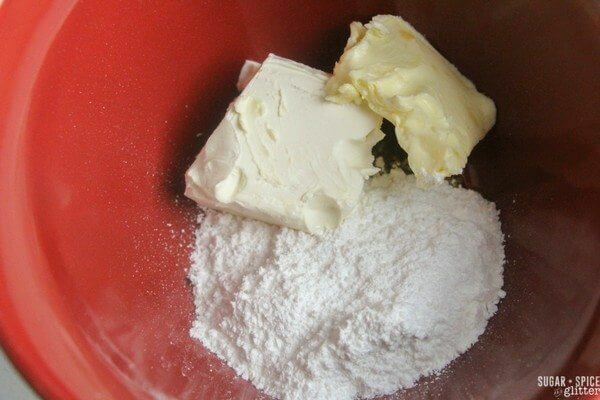 Add less icing sugar at first and taste as you go to adjust. We used less icing sugar so we could have a more pronounced cream cheese flavour. 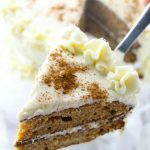 Add more milk or cream if you want a thinner frosting consistency. 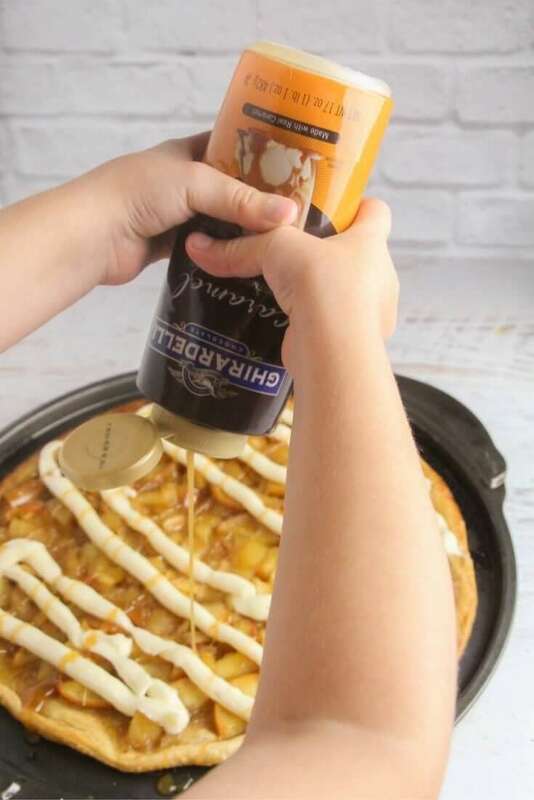 Let the pizza cool slightly before frosting, unless you don’t mind the frosting melting. 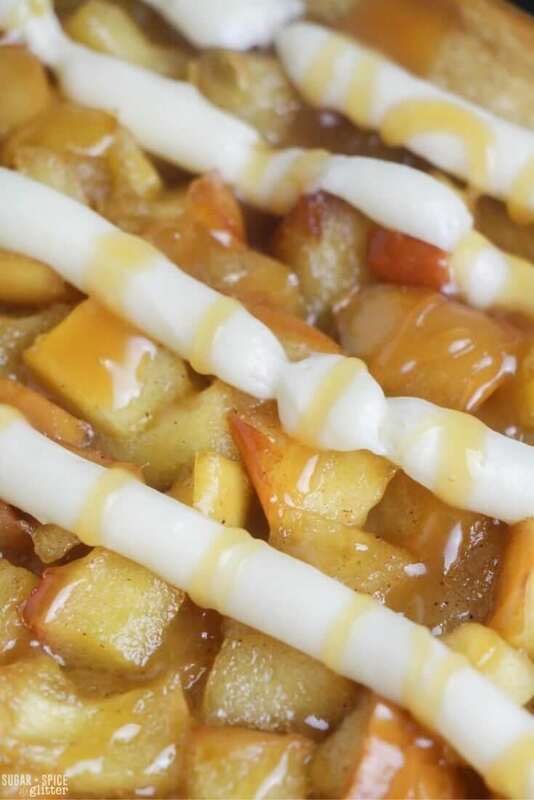 Finally, drizzle on the caramel ice cream topping and any additional garnishes you desire. Cut with a pizza slicer and serve! 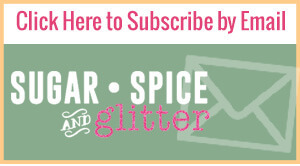 For an overview of what we keep in our kids’ kitchen cupboard, check out this post. 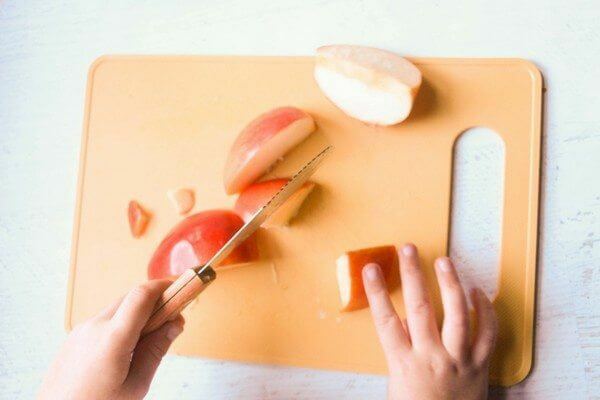 First, have your child chop up the apples into 1" cubes. 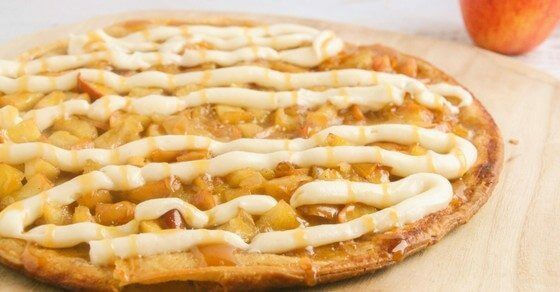 Let the pizza cool slightly before frosting, unless you don't mind the frosting melting. 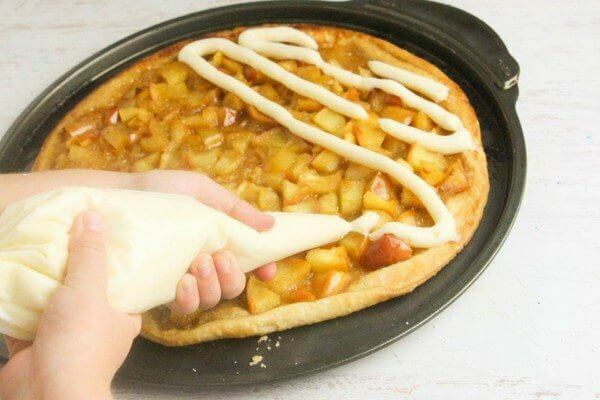 Place the frosting in a piping bag and pipe onto the pizza in whatever pattern you prefer. 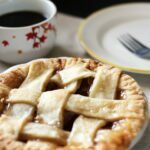 Do your kids love helping in the kitchen? 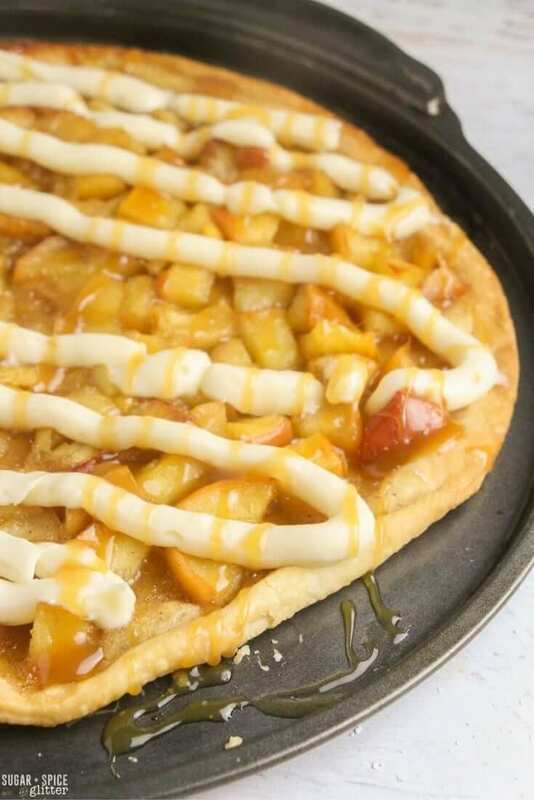 Let us know if you end up trying this delicious apple pie pizza recipe with them! 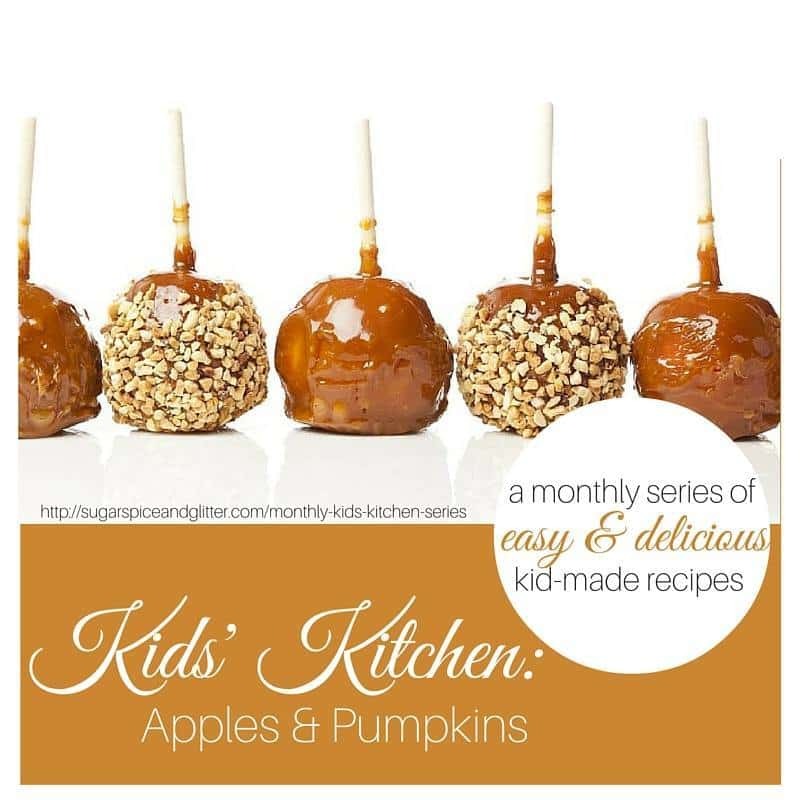 Check out the rest of the posts in our monthly kids’ kitchen series here. 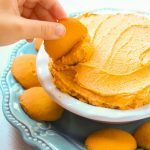 Check out these other delicious Fall Desserts that Kids Can Make!